Understanding Tongues: Was Tongues Redefined in Acts? – in Acts 10: 1-8 Cornelius (a Roman centurion described as “a devout man who feared God with all his household, gave alms generously to the people, and prayed continually to God” – Acts 10:2) was told that “Your prayers and your alms have ascended as a memorial before God. And now send men to Joppa and bring one Simon who is called Peter.” (Acts 10:4b-5). Cornelius then sent his some of his underlings to get Peter (Acts 10:7-8). – In Acts 10:9-16, Peter had a vision (three times – Acts 10:16, the repetition of which is clearly emphatic) in which God commanded Peter to eat unclean animals, Peter objected, and God responded “What God has made clean, do not call common” (Acts 10:15). – In Acts 10:17-23, as Peter was still perplexed at the meaning of the vision (Acts 10:17, 19), Cornelius’ underlings came to get Peter. They explained why they had come (Acts 10:22) and stayed the night at Peter’s house (Acts 10:23). – In Acts 10:23-33, Peter and several fellow believers from Joppa (Acts 10:23) went to meet Cornelius. Cornelius had invited a large group to hear Peter (Acts 10:24, 27), and he initially worshiped Peter (Acts 10:25) but Peter would not accept it (Acts 10:26). Peter then showed that he had finally made sense of his strange vision when he said “You yourselves know how unlawful it is for a Jew to associate with or to visit anyone of another nation, but God has shown me that I should not call any person common or unclean. So when I was sent for, I came without objection. I ask then why you sent for me.” (Acts 10:28-29). Cornelius then related the story of his prayers, the angelic messenger, and his sending for Peter (Acts 10:30-33). – In Acts 10:34-43, Peter delivered a gospel proclamation to Cornelius and the rest of those who had gathered there. Peter began that proclamation with a re-statement of the meaning of his vision. Peter said “Truly I understand that God shows no partiality, but in every nation anyone who fears him and does what is right is acceptable to him” (Acts 10:34-35). Peter went on to describe the events surrounding the life, death and resurrection of Christ (Acts 10:36-41), and closed off by saying “And he commanded us to preach to the people and to testify that he is the one appointed by God to be judge of the living and the dead. To him all the prophets bear witness that everyone who believes in him receives forgiveness of sins through his name.” (Acts 10:42-43). (a). Peter’s revelation about the worldwide offer of the gospel was verified. (b). The inclusion of the Gentiles into the church (and new covenant) was confirmed. (c). 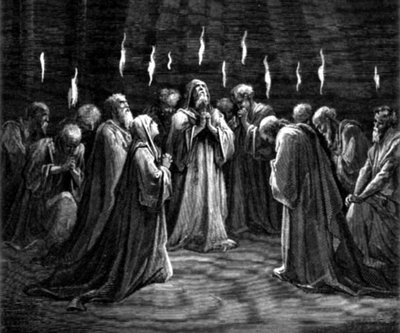 The Gentiles received the Holy Spirit with exactly the same manifestation of tongues as the Jews did. This last point (from vs. 47) certainly seems to declare, quite clearly, that the nature of the tongues hadn’t changed since Acts 2. It was exactly the same gift, fulfilling 2 separate purposes. Absolutely no redefinition of tongues is found in Acts 10. – In Acts 19:2-4, Paul learned that these believers had only received John’s baptism and weren’t even aware of the giving of the Holy Spirit. Paul told them that John’s baptism was a baptism of repentance that pointed to Christ. So this was a relatively short and passing reference to tongues, but it seems fairly clear that there was no redefinition of the gift of tongues here (nor prophecy). It’s also worth nothing that Acts 19 comes after Acts 18, where Paul Paul spent over a year and a half establishing the church in Corinth. This suggests that the tongues that the Corinthians learned were identical to the tongues that were practiced in Acts 2; namely earthly languages. Here’s one other passage where the term “tongues” does not directly appear, but is still mentioned; Acts 15:7-9. (b). God bore witness to this fact by giving them the Holy Spirit “just as he did to us”. One could argue that the “just as he did to us” was simply an outpouring that was equal in magnitude, but Acts 2 & 9 suggest that the proof of the outpouring was the confirming sign of tongues (and prophecy). – The thing to get from this passage is that after Acts 2, the gift of tongues re-appears (amazingly rarely over the course of the 25+ years between Acts 2 and Acts 19), but in the book of Acts it is never redefined after the second chapter. So the only other mention of tongues in the entire New Testament comes in 1 Corinthians 12-14. The next Bible Bite I do will tackle 1 Corinthians 12 & 13, and I’ll probably spend two posts dealing with 1 Corinthians 14. ← Quick Thought – Should Christians have no teachers except the Holy Spirit? Sola Glossolalia? What mockery of the Holy Spirit. Why should anyone listen to you if you are willing to actually mock the Gifts of the Holy Spirit? This reveals the heart. Even if you think tongues are not for today, what would justify you making fun of a Gift of the Holy Spirit? I’m not mocking the gifts. I’m mocking the ramifications of the doctrine of subsequence, as they are “on the street”. You know my heart as much as I know yours. Feel free to whoever tickles your ears. I won’t attempt to confuse you with scripture and reason.